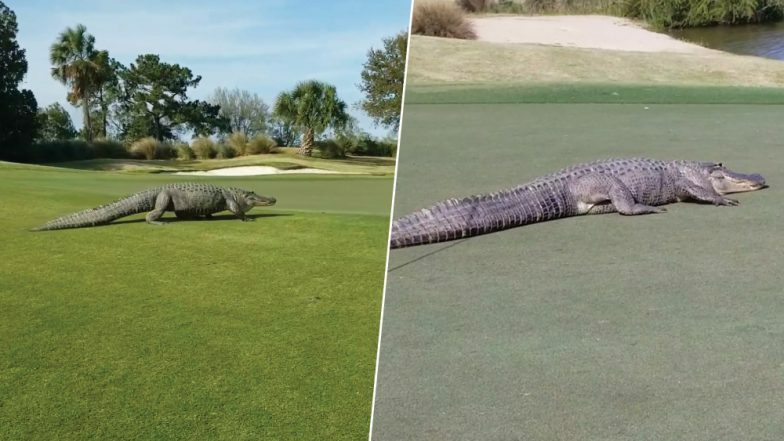 A giant alligator made way through a golfers course in Savannah, Georgia giving people the scare of their lives. It emerged out of a bush and passed across the lawn as people watched in shock. The incident happened at 17th green in Savannah Harbor Club on Hutchinson Island. The alligator which was about nine-feet-long interrupted a golf game and slowly crawled across the green carpet. One of the golfers recorded the rare sight and posted the video on Facebook. The clip has gone viral with people exclaiming at the rarity. Fortunately, the gator appeared cool and maintained his cool without causing any harm to anyone. Golfer Ed Vance who recorded the scene with his phone told Island Pocket, "I will always remember the sound of his feet when he was walking on the green. The video doesn't pick it up, but the 'thud, thud, thud' sound was what you would think a dinosaur sounds like. It was surreal." Massive Alligator 'Fabio' Spotted Strolling Across in Florida Reserve, Watch Video. In between when the alligator stopped for a moment, the video shows one of the golfers retrieving his putter which was lying near the edge of the pond. Vance said, "It did not appear to notice or care about us at all. It just wanted to get back to the pond." He said it was a once-in-a-lifetime encounter for all the golfers. The golf course on Hutchison Island is close to Savannah National Wildlife Refuge which is a conservation area known for alligators. Last year, a photographer had captured a video of 50 alligators in a pond in the area. 'Biggest' White Shark Spotted in Hawaii: Divers Swim Together With the Great Predator, Watch Video and Pics. Vance added saying "We notice them and respect them, but really don't pay that much attention to them because we are used to them and we expect them to be there. It is their habitat we are in. This was definitely a different experience though. He was massive and you just don’t expect them to walk up to the green while you are there."